Mr. Kadek Budiana is our Executive Chef, he is very experience in cooking all kind of foods. From Western food, Indonesian food and Balinese spicy food. He joined THE LOVINA Bali Resort about 6 months ago and we got a lot of positive comments from the guests. He could cook any kind of food that you wish to try in this world. 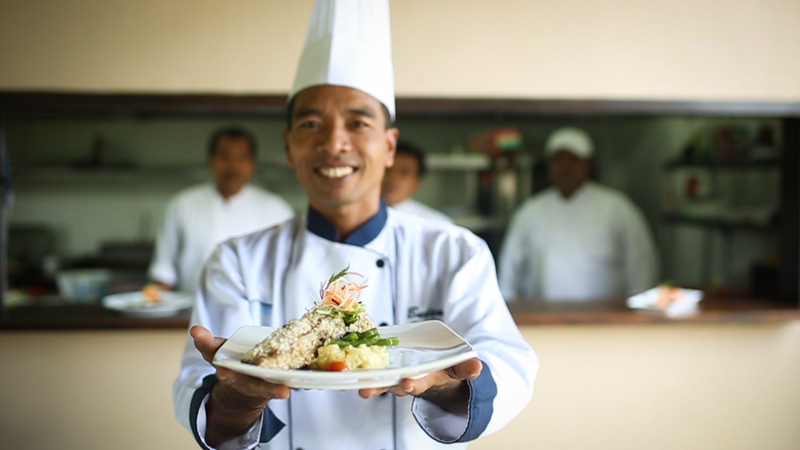 Come and stay at THE LOVINA Bali Resort and you will find our signature dish that only can be cooked by our Executive Chef Mr. Kadek Budiana. Our Heliconia Restaurant and Beach Bar is ready to serve the foods immediately. Beach Barbecue dinner at THE LOVINA-BALI. All the guests were happy and enjoy the foods, The dinner was set-up overlooking to beautiful lovina beach, bali sea.